The world is filled with ancient unexplained mysteries that capture the imagination and challenge scientists and scholars. Archeologists attempt to identify and explain the purpose of these ancient mysteries of the world, but some mystify and confound scientists. Others are simply relegated to the vaults of the unknown. The mysteries surrounding many ancient archeological finds remain. Different theories try to explain who built them, what the structure's purpose was and most importantly what kind of technology existed to allow such amazing construction. Dubbed by the Smithsonian as possibly the world's first temple, Gobekli Tepe (potbellied hill) in Turkey has been carbon-dated around 9,000 BC. That's 6,000 years before Stonehenge was built. Though it was discovered in the 1960s, it wasn't until 1994 that the site was excavated and a megalithic ring of stone pillars uncovered. Archeologists believe that the high T-shaped pillars once supported a roof. With only one-tenth of the 22-acre complex unearthed so far, scientists are astounded by indications of 16 more buried circles, each ranging from 32' to 98' in diameter. The stones feature elaborate relief carvings of humanoid figures and animals. Scientists can't explain who built the rings, what purpose they served or why the rings were deliberately buried 1,000 years after being built. Perhaps the most perplexing mystery is the lack of artifacts, such as tools and housing structures for workers, typically found at such archeological sites. Stonehenge is a ring of standing stones located in Wiltshire, England. The inner circle of stones is over 24 feet high. Archeologists date the structure between 3,000 BC and 2,000 BC. There is much speculation over the original purpose of the stones and how they were transported to the site. Some believe the henge was used for rituals, ceremonies, and burials. Researchers note that the stones were intentionally aligned with the summer and winter solstices. This World Heritage Site is owned by the Crown of England and managed by the English Heritage with the surrounding land owned by the National Trust. The English Heritage website offers visitors an interactive virtual tour inside the circle. A discovery of "17 other ritual monuments" in the area surrounding Stonehenge was reported on September 10, 2014. Researchers from Birmingham University participating in the Stonehenge Hidden Landscapes Project used ground penetrating radar to find outlying fields, a pond, a large pit, and several enclosures. Scientists will have to study the findings to interpret exactly what the discovery means. The Mithras religious sect evolved almost 2,000 years ago within the Roman Empire. Its teachings and principles were shared only with initiates, mostly Roman soldiers. There is very little documented information about this sect and their teachings. However, in two Oxford University Press books, author David Ulansey discusses the Mithraic Mysteries. The cult's underground temples (Mithraea) were 30 feet wide by 75 feet long and built to mimic caves. They contained iconic carvings and symbols, but their meanings are lost to modern civilization since no texts have ever been found. At one time there were nearly 1,000 Mithraic temples within the Roman Empire. One central icon depicts their Persian god Mithras killing a bull. A dog, raven, scorpion, and snake are Mithras' companions. Two other iconic statues sometimes found in temples depict Mithras being born from a rock and Mithras dining with the sun god, Sol. Deemed as a "mystery religion" since there is no written doctrine, narratives or theology to reference, only bits and pieces. What little information researchers have found was gleaned from inscriptions and brief references in Latin and Greek literature. Archeologists have uncovered a couple of Mithraea and are learning more with these excavations. The Sphinx, located in Egypt below the Giza pyramids and slightly east, is said to be one of the world's oldest and largest monolithic statues. It stands 66 feet tall and is 240 feet in length. The renowned sleeping prophet Edgar Cayce predicted that the lost records of Atlantis would be discovered in a chamber underneath the paw of the Sphinx. This prediction added to the unique mystery of this enormous artifact. Experts conclude that the Sphinx was carved from a massive slab of limestone. The Smithsonian reports that the face was once painted red and other areas painted blue and yellow, yet no one knows why it was built, who built it or what it represents. Since there is no mention of the Sphinx statue in Egyptian stories, the researchers have little to go on. Standing Stones (Menhir) are individual tall, upright stones found throughout the world, with high concentrations in Ireland, Great Britain, Brittany, and France. These mysterious remnants are representative of yet another culture lost to the modern world. The giant stones haunt pastures and hillsides around the world. A vast number of standing stones remain in their original positions of circle, henge, horseshoe or oval configurations. In his book Before Atlantis, Frank Joseph states there are 50,000 menhirs remaining in Ireland, Great Britain and Brittany and that France boasts 1,200. 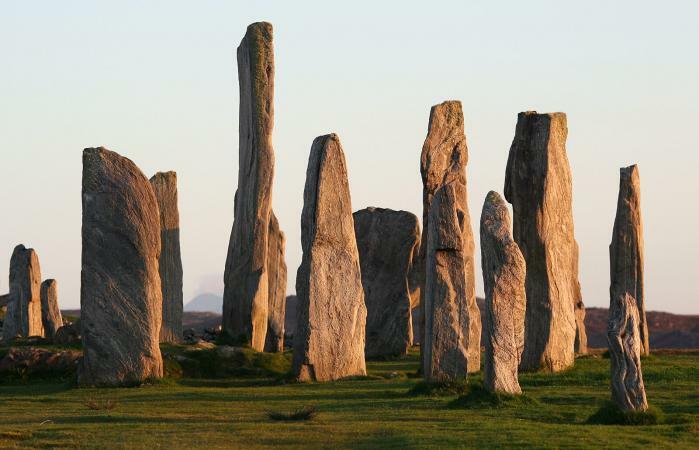 The massive stones range from 10 feet to 30 feet in height and are typically squared and uneven. The tops are generally tapered. Nearly impossible to date, recent research estimates that many of the stones were set 6,000 to 7,000 years ago. The Scottish Archaeological Research Framework website depicts many of the Celtic stones with various iconic carvings of animals, objects and Celtic knots. 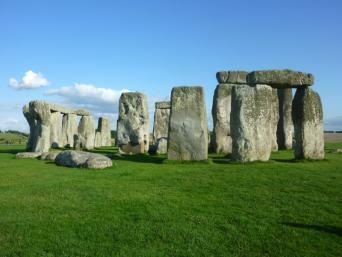 Some researchers speculate that the stones were sacred Druid ceremonial structures. Others believe the stones were territorial markers or calendars. While most people recognize Egypt's Giza pyramids, not everyone knows there are a total of 138 pyramids in Egypt alone. For example, the Mayan civilization built their iconic flat-topped pyramids, with the Temple Mayor of Tenochtitlan being the largest, in Mexico. Much later along the timeline, China built its version of pyramids as tombs for their emperors and generals. The construction of the Chinese pyramids are credited to four dynasties beginning in 206 BC and as recently as 1279 AD). During World War II, an American pilot flew over northern China and saw what was dubbed the White Pyramid. There are a total of 38 pyramids along the Qin Chuan Plains of Shaanxi Province. Part of the Tiwanaku complex located in Bolivia on the Altiplano, the age of the ancient site of Puma Punku is still being debated. Some experts believe it was created around 500 BC while others place it 12,000 to 17,000 years ago. The Incas inhabited the region in 1470 and was considered the place where all life was created. The construction and masonry of the walls are considered an engineering mystery since there are no known tools or techniques that existed during any of these time periods. Much of the Puma Punku wall structures appear to have been destroyed during some type of cataclysm. The stone retaining walls were precision cut in H-shapes that mystify archeologists. If the stones were quarried from a nearby dormant volcano, the tools and means to transport to the site remain a mystery. The stones fit together so precisely there isn't enough space for a razor blade to fit between them. To add more intrigue to the mystery, it was recently discovered the stones are highly magnetized. Some of the world's mysteries lie in history with no artifacts remaining of their existence. Others remain with no explanation of their purpose or who created them. The Hanging Gardens of Babylon, a lush display of greenery and flowering plants, were believed to be part of Babylonia, the capital of Mesopotamia, which was located in modern day Iraq. The exact location of the gardens is unknown and under debate. 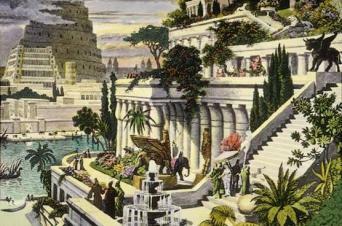 In 290 BC, Babylonian priest Berossus of Marduk wrote about the Hanging Gardens of Babylon. Although his books no longer exist, quotes from them were used by other writers in reference to the gardens. Berossus wrote that the gardens rose in tiers with 22'-32' thick walls with a 10' passageway between them and were designed to resemble a mountainside. Since the gardens were situated in the midst of a dry, hot environment, the ability of their creator to create an irrigation system to keep the plants watered is one of the mysteries of the site. Berossus was the only writer to attribute the creation of the gardens to King Nebuchadnezzar, who built the gardens for his homesick wife. Others credit Assyrian King Sennacherib (704-681 BC) as the builder. Located in southern Peru's Nazca Desert, the purpose of the desert drawings knows as the Nazca Lines is debated by scientists, scholars, and theorists. When first noticed in 1553, the lines were misidentified as trail markers. It wasn't until 1940 that researchers took notice. National Geographic reports that several hundred lines create geometric shapes, trees, flowers and over 70 animal shapes, such as birds, monkeys, llamas, fish, jaguars, whales, and lizards. 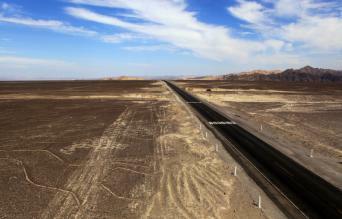 The largest figures are 660 feet wide and best viewed by plane. Scientists have determined that the lines were created sometime between 400 AD and 650 AD. Their creators and purpose remain mysteries. Some scientists theorize that the lines were an elaborate irrigation system. Others speculate that the Nazca people created the figures in tribute to their sky gods. Easter Island is located in the South Pacific Ocean some 2,500 miles east of Tahiti and over 2,300 miles west of Chile. It's well-known as the remote Pacific island of over 1,000 unusual statues (moai). No one knows how or why the statues were created and up until 2012, it was believed that the statues were simply heads. This belief came crashing down when the Easter Island Statue Project excavated two statues and discovered complete bodies buried underneath the stone heads. A little-known fact about this locations is the discovery of Rongorongo, a system of glyphs that was discovered during the 19th century. No one has been able to decipher the glyphs. Around 24 wood objects, mostly tablets, are inscribed with the glyphs. Researches also discovered ornaments, a Chief's staff and a bird-man statue bearing the same glyphs and several petroglyphs (carved stones). The strange haunting 2,000-year-old megalithic cylinder-shaped objects cover a large area known as the Plain of Jars. It is speculated these jars were used in some form of ancient funeral service. Located in the northern Xieng Khuang province of Laos, the jars are made of sandstone. Some of the jars weigh approximately one ton and are around 10 feet tall and 3 feet wide. Due to the dumping of over 270 million cluster bombs, visitors are allowed to visit only certain sites. Site one is open and contains around 300 jars. Burial sites are being exhumed that contain human remains and some are in smaller jars. Archeologists to believe the larger jars were used to remove the flesh from the bones so the bones could then be buried in smaller jars. However, some locals discount this theory, believing the jars were used to brew rice wine for a band of giants, while others attribute the massive jar size as a way to store a local giant's whiskey. In 1912, coal miners working in the Municipal Electric Plant in Thomas, Oklahoma discovered a hand-sized iron pot that fell from a large lump of coal. Having been embedded inside coal that is 300 million years old experts examined the pot and the coal with the pot imprint. It was assessed that the pot had been encased in the coal and placed the age of the iron pot at 312 million years old. The pot now resides with an unknown private collector with a certificate of authenticity. There are books, manuscripts, and writings that defy explanations. Petroglyphs that can't be deciphered and manuscripts that no one understands are just some of the mysterious ancient texts. The Voynich Manuscript, a centuries-old book, is owned by Yale University and available online to the general public. It's called the "most mysterious manuscript in the world." The 240-page book is written in a language that no cryptographer has been able to decipher. To further compound the mystery, the pages are filled with drawings of mostly unknown plants and flowers. Carbon testing placed the age of the book to sometime during the second part of the 15th century. Due to its content, the Voynich Manuscript was declared a hoax, created to fool the German emperor Rudolph II who paid 600 gold ducats for it. Recently, a few linguists have stated they've made breakthroughs in identifying structure similarities in the writings, proving the book is not a hoax. Until someone is able to decipher the book, its author and contents remain a mystery. This voluminous book also called Codex Gigas was made from 160 animal hides and is said to contain all the world knowledge at the time it was written during the 12th century. The story behind its creation is dark and tells how a monk broke his vows and was about to be walled up alive when he cut a deal with the monastery. Allow him to write a book filled with all worldly knowledge in one day's time and he would be allowed to live. In order to meet this impossible task, it's said the Monk traded his soul to the devil. Although the book itself is strange being too large for one person to lift, it also contains a drawing of the devil and 12 pages of unknown content are missing from the book. Judaculla Rock is a petroglyph located outside Cullowhee, North Carolina. It's the largest of its kind in the state and one of the largest petroglyphs in Southeastern US. The stone has yet to be deciphered with its various markings, spidery lines, and unusual symbols. The stone markings are dated at 10,000 years and has a special connection and meaning to the Cherokee Nation. Parts of the stone depict animals and their tracks, geometric shapes, suns, and people. The rock is named for the giant spirit Judaculla. The story of this spirit is told in Cherokee oral history and how he created the rock. In fact, his seven-fingered handprint is pressed into the rock when he caught himself from a fall. The Cherokee people held this site as sacred. The complete story told by the rock has yet been deciphered, but the Cherokee believe along with the handprint, Judaculla also drew a long line through the rock with his finger to demonstrate the separation between the earthly world and his spirit world. These and other ancient mysteries raise questions about ancestors who often appear more advanced than the modern world. Archeologists continue in their quests to solve these puzzles, but many of the missing pieces remain lost to the world.